In the United States, children and adults alike have been preparing for Halloween for several weeks; searching for the perfect costume, decorating homes, and buying candy for trick-or-treaters (one quarter of all the candy sold annually in the U.S. is purchased for this day!) While Halloween continues to be a very popular tradition in the United States, each country still remains unique in the way they celebrate life and death. We’ll tell you how countries around the world celebrate this particularly spooky day, but first, a little Halloween history. One of the oldest holidays in the world, Halloween’s origins are rooted in the ancient Celtic Festival of Samhain, which commemorated the ancient Celtic New Year on November 1st. This day marked the end of summer and the harvest, and also, the beginning of the cold winter, a time of a year associated with darkness and death. The ancient Celts believed that the night before the “New Year”, which is October 31th, the boundaries between the worlds of the living and the dead overlapped and the ghosts of the dead returned to earth, causing trouble and damaging crops. Celebrations included the building of bonfires, animal sacrifices and dressing up in costumes. After the Romans conquered Ireland and the British Isles during the 1st century A.D., the celebrations were combined with the Roman festival of Feralia, which commemorated the passing of the dead and following the advent of Christianity, the holiday became associated with “All Souls Day,” which also celebrated the dead. During Halloween, the district of Itaewon, in the heart of Seoul, closes its streets to traffic. Various booths are set up to prepare for a wide variety of festivities, including live music, and costume contests. In addition, the majority of the restaurants, clubs, and bars in this neighborhood put on different events where expats and Koreans gather for late nights of carousing and dancing – all in costume of course! The locals celebrate a festival known as Teng Chieh (The Festival of the Hungry Ghosts), where food and water are placed in front of photographs of family members who have departed and lanterns are lit in their honor. Halloween is considered the Obon Festival in Japan, which is also known as “Urabon” or “Matsuri.” One finds red lancers hung around the town and candles lit to honor the spirits of one’s ancestors. The lanterns are then sent to float down rivers and seas. During the Filipino version of Halloween, known as Pangagaluluwa, children pass from house to house offering a song in exchange for food, candies, or money. The meaning of this tradition is that the kids sing for the souls of those who are still in the purgatory to help them to go to heaven. On November 1st, Italians celebrate “The Souls Day” on November 1st with traditional food and customs. One of the favorite preparations is “Fave dei Morti” a traditional cookie recipe that is offered as a ritual offering to the dead and gods of the nether world. American-style Halloween is a new phenomenon in Spain, but its popularity is growing. The Catholic feast of ‘All Souls Day’ has been marked for centuries and October 31st is known locally as “El Día de las Brujas” (Day of the Witches). “The Day of the Dead” is called “Dušičky,” which many Czechs mark by visiting cemeteries and graves of departed loved ones. Another old Czech tradition is to place chairs around the fireplace on Halloween night – one for each living family member and one for the spirit of each departed family member. Halloween celebrations are becoming increasingly popular in Chile, particularly in major cities like Santiago, where shops, supermarkets, and malls break out special decorations and kids wear costumes and knock on the doors of their neighbors asking for candy. In addition, clubs, pubs, and bars organize a variety of colorful parties and events, including costume contests and masquerades parties. On November 1st many families mark “All Saint Days” (El Día de todos los Santos) by visiting the cemetery to place flowers on graves, and also balloons or teddy bears to decorate the tombs of children. It’s a time of reconnection and remembrance for those who have departed life on earth. Among many Spanish-speaking countries, Halloween is known as “El Día de los Muertos” (the Day of the Dead), and incorporates a three-day celebration that begins on October 31st and ends on November 2nd. It’s the time of the year when families remember their dead and the continuity of life. It’s also a time when monarch butterflies are returning to Mexico from the north, and are thought to bear the spirits of the departed who are coming home. Families set up altars with flowers, bread, and candies next to pictures of family members. Ireland is considered to be the birthplace of Halloween. The festivities here are not much different from the well-known American celebrations during Halloween; dressing up in costumes, attending parties and play games. “Snap-apple” is a popular game among the Irish, where the participants take a bite out of an apple hanging on a tree and tied with a string. 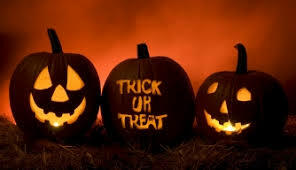 Apart from trick-or-treating, children also play a trick known as “knock-a-dolly” which involves children knocking on their neighbors’ doors and running away before they answer them. The Irish traditionally eat a fruitcake called Barnbrack on this day, which has a treat baked inside the cake and, depending on which treat is inside, will foretell the future of whoever receives it. Don’t cross paths with black cats to avoid bad luck. This has roots in the Middle Ages, when people believed witches avoided detection by turning themselves into cats. Don’t walk under ladders to avoid back luck. This is believed to have origins from the ancient Egyptians, who believed triangles were sacred. In 18th century Ireland, a matchmaker would bury a ring in mashed potatoes on Halloween night, hoping to bring true love to the person who finds it. At Halloween parties, the first successful apple-bobber was believed to be the first to walk down the aisle. Avoid breaking mirrors and stepping on sidewalk cracks. Happy Halloween, we hope you have a scary good time!